Chips and Dip. It’s easy peasy and yet so incredibly delicious. They’re the practically the go-to staple for most Super Bowl parties and often is the first thing to quickly go empty. 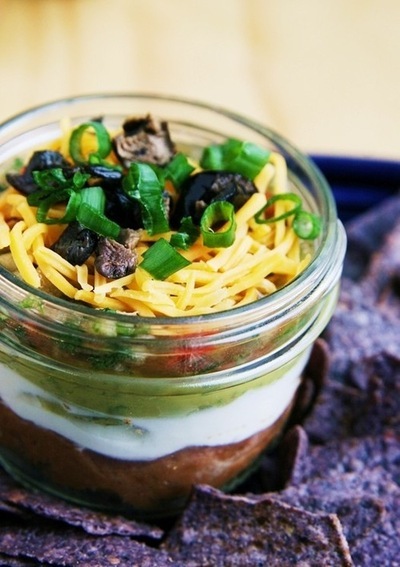 One of the most beloved dips of all time is the Seven Layer Dip. With yummy layers of beans, cheese, sour cream, guac and salsa, it literally has something for everyone. Including other’s saliva, germs and double dipping finger goop when made in one large communal bowl. Wanna get the same tasty treat but with out swapping spit with total strangers? Then lets do this! The trick to this individualized awesomeness is to use jelly jars as your dip hub, rather than one large everybody-all-at-once bowl. So first and foremost, grab yourself a flat of 4 oz. jelly jars. Then grab a can of refried beans, taco seasoning, sour cream, guacamole, salsa, shredded cheese and of course, bags o’ chips. The most painstaking part of this whole process is the mixing of the taco seasoning and the refried beans. And by painstaking we mean 5 whole mins of your time to dump, stir and scoop into each of the jars. UGH, we know….the horror! Once you’ve survived that, simply add the other ingredients in layers, making sure to leave the salsa chunky and most importantly, second to last layer followed by the cheese. The more dense the condiment, the more it needs to remain on the bottom or the middle otherwise your layers will become Dali-esque rather quickly. Garnish with whatever you like – be it scallions, jalapeno slices or (cringe) black olives. We personally think they look much better as a garnish rather than a guest of our mouth but if you’re into that sort of thing, have at it with full force. Then lid your individual mini dips and pop in the fridge until it’s party time. If you wanna make it even sweeter, pop on a label and pre-name them for your guests. Aside from being a lovely welcome gesture, its a little window into who really likes your dip and who doesn’t….all of which is excellent intel when setting up dinner party menus. And there you have it kiddies! Now you can keep other grubby paws out of your personal layered goodness and make each guest feel super special all while leaving the spit-swapping to the single act of French smooches. Hey their population is 64876618.43 million strong and growing so they’re clearly on to something good. And we say, if it aint broke, dont fix it…and dont double dip it, neither.